The week before Christmas two of my dear friends were getting married. I decided about 3 weeks before that to make them a wedding quilt. so I made quite a few more blocks to enlarge it to a queen size. This is the original quilt, Little Crosses. I wanted to use modern colours with a soft grey background. Here is a photo of the first fabric pull. The fabrics are by Carolyn Friedlander, Cotton and Steel, and a few others that I added later as I needed more fabrics! The grey fabric is from the Art Gallery Fabric's Pure Elements range and the colour is Mystic Grey. I really like how the sashing is the same colour as the background fabric used in the blocks. 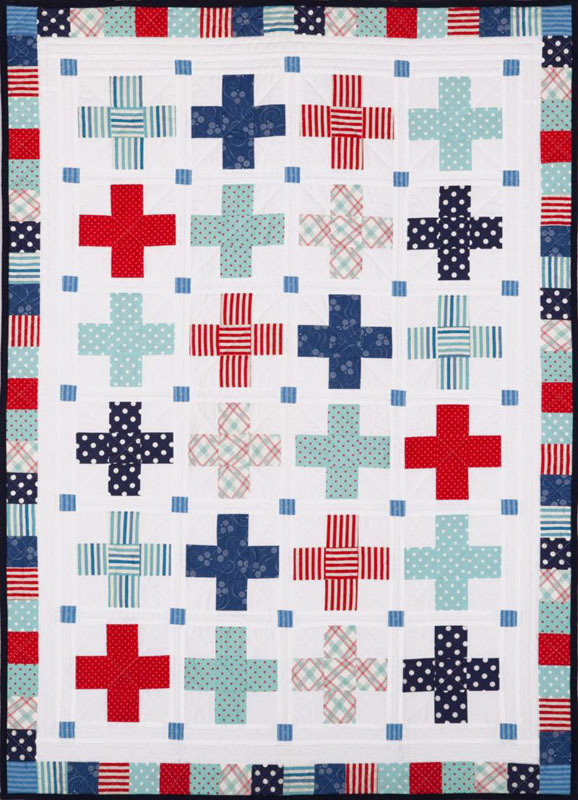 It makes the crosses float and become the stars of the quilt! I then added a white corner block in the sashing. And a border which uses the same size squares as used in the blocks. For the quilting I just kept it simple. Lots and lots of straight lines!! The backing is a Cloud 9 organic cotton, so the quilt is extra soft. Another Cotton and Steel fabric was used for the binding. I am so pleased to report that the happy couple loved it! or retail from your local quilt shop.